We really valued our discussions with the EURODECISION engineers, as design optimization is not our core business. Thanks to the expertise they transferred to us we were able to make real progress on these issues. Furthermore they came up with a methodology response that could be used by our teams and replicated on other topics. HERAKLES, a SAFRAN1 Group subsidiary, is a major aerospace industry player. It manufactures solid thruster fuel – the fuel that propels space launch vehicles. The company also designs propulsion engine parts including the SRM2 nozzles for Ariane 5. The HERAKLES Calculation Division focuses on mechanical, vibration, thermal and aerodynamic behavior modeling to produce the leanest propulsion system designs and dimensions. A short while ago, HERAKLES decided to look into design optimization solutions, essentially because weight reduction is a major issue for industry and aerospace in particular. The initial studies made by the Calculation Division engineers incorporated a few optimization variables using the SAFRAN Group tools laid on for them. As they recognized the potential of optimization studies, the team was keen to acquire real skills in this area. Subsequently HERAKLES commissioned EURODECISION, the decision mathematics and multidisciplinary optimization specialist, to devise a design optimization methodology that would address its issues and that could be transposed to Optimus, its own optimization platform and reapplied elsewhere. EURODECISION first took on an optimization study on a real world example as the best way to define this methodology. The study on a rear assembly part of a motor body covered 34 optimization variables, whose project scope was much broader than the manufacturer had previously been able to undertake. 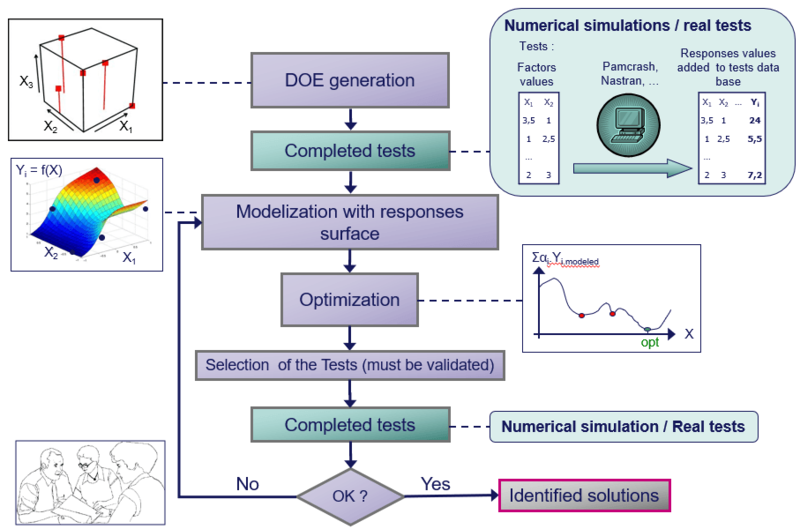 The EURODECISION engineers applied their optimization expertise to generate experimental designs of the simulations run on HERAKLES’ servers. Response surfaces were constructed on the basis of this data, and were gradually refined on each iteration (cf. the above “Experimental design method” diagram). The results analyzed during the study were used to guide optimization strategy with the upshot that the weight of a rocket motor part was reduced by about 10%, for like performance (rigidity, distortion, etc.). EURODECISION then wrote a step-by-step technical brief tracking the various stages to be followed in a design optimization study. The methodology, illustrated by the actual example of the housing, primarily identified which avenues should be explored for making new calculations in line with the initial results and identify the feasibility areas of the design environment. Throughout the project, the HERAKLES and EURODECISION teams worked closely together. Furthermore, EURODECISION’s optimization know-how, listening and business understanding capacities were highly appreciated by the Calculation Division. EURODECISION developed a methodology that HERAKLES engineers value as a real aid to decision-making as it meets their design deadline constraints. The Calculation Division has effectively witnessed how efficient the implemented process is, as good results are already emerging from a new optimization project.